Preheat oven to 400°F (204°C). Grease a 6 qt. casserole dish and set aside. In a large skillet, sauté onions and garlic in butter until tender over medium heat. Slowly add Kinnikinnick All Purpose Flour to onion mixture and stir until combined. Slowly add vegetable stock to onion mixture, stirring until thickened (about 3-5 minutes) over medium heat. Reduce heat to medium low and add cream, continue to stir until thickened slightly (2-3 minutes). Remove from heat and set aside. Spread half the potatoes evenly on the bottom of casserole dish, season with salt and pepper. 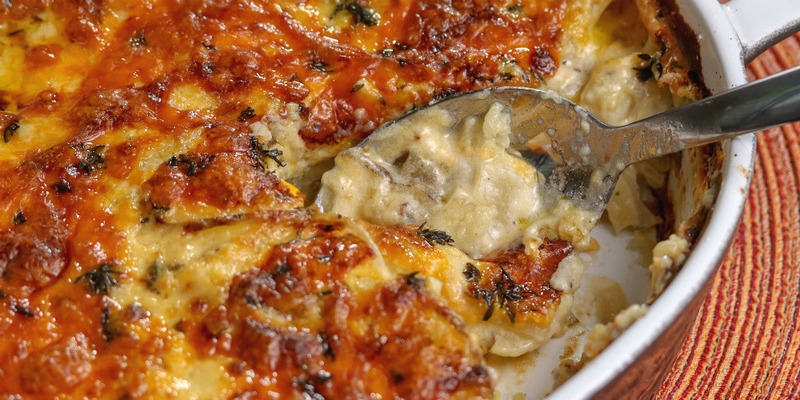 Top first layer of potatoes with ½ the creamed onion mixture, 1 cup of the cheddar cheese and all of the parmesan cheese. Add layer of remaining potato slices. Season and spread remaining onion cream mixture evenly over potatoes. Top with 1 cup cheddar cheese and thyme. Cover casserole dish with foil and bake for 40 minutes. Remove foil and continue to cook for an additional 30 minutes or until potatoes are tender. Russet or Yukon Gold potatoes work best for scalloped potatoes because they're high in starch, creating a creamier/thicker/richer dish.